1. Especially for these compact boards, any problems with stock processor heat sinks blocking DIMM slots, i.e. do DIMMs with heat spreaders still fit with a Wraith or Spire cooler, respectively? 2. I have my eye on the Aorus Pro WiFi or something similar, but am wary of the placement of the WiFi antenna connectors right next to two of the USB 3 connectors. I frequently use 3-4 USB 3 devices at the same time frequently, and am wary of the USB 3 - WiFi interference with that placement. Any chance Gigabyte could state if/that they got that taken care of? On the surface, this seems like it has totally ignored the bifrucation limitations that supposedly are inherent to the B450 chipset. x3xx to x4xx same concept, reduced price to produce so they save some money, but the vast majority of vendors used these "savings" to cram more disco light show RGB on the boards to jack the price up some instead. 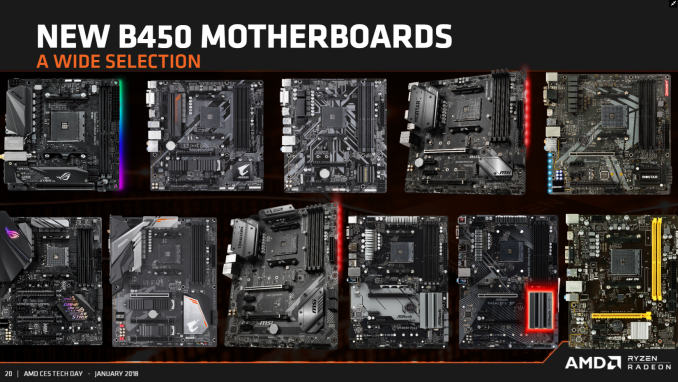 As documented by Buildzoid, the Asrock B450 Pro4 does not have the claimed 6+3-phase VRM. It is a pure 3+3-phase. Same probably applies for the B450M Pro4.